IBM® System Storage® N series storage systems offer an excellent solution for a broad range of deployment scenarios. IBM System Storage N series storage systems function as a multiprotocol storage device that is designed to allow you to simultaneously serve both file and block-level data across a single network. These activities are demanding procedures that, for some solutions, require multiple, separately managed systems. The flexibility of IBM System Storage N series storage systems, however, allows them to address the storage needs of a wide range of organizations, including distributed enterprises and data centers for midrange enterprises. IBM System Storage N series storage systems also support sites with computer and data-intensive enterprise applications, such as database, data warehousing, workgroup collaboration, and messaging. 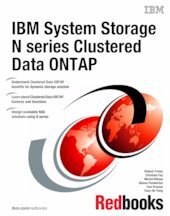 This IBM Redbooks® publication explains the software features of the IBM System Storage N series storage systems with Clustered Data ONTAP (cDOT) Version 8.2, which is the first version available on the IBM System Storage N series, and as of October 2013, is also the most current version available. cDOT is different from previous ONTAP versions by the fact that it offers a storage solution that operates as a cluster with flexible scaling capabilities. cDOT configurations allow clients to build a scale-out architecture, protecting their investment and allowing horizontal scaling of their environment. This book also covers topics such as installation, setup, and administration of those software features from the IBM System Storage N series storage systems and clients, and provides example scenarios.